Data Transfer Between Mobile Devices And Computers. We are going to present new software tools for file transfer, which also include powerful mobile tools to solve problems when you are using phones and tablets. Transfer data between ipad, iphone and computers: transfer contacts, SMS, photos, music, video, and more on your iPhone and iPad. That is, FolderTransfer.com will provide full file transfer solutions for both comuputers (Windows or Mac PC) and mobile devices no matter they are iphone, ipad or andriod phone or tablet computer. I have 20 Computers - A in USA, B in Tokyo, C in London, D in Bombay, E in Dhaka, and so on. I have data files TokyoTest.dat in B, LondonTest.dat in C, BombayTest.dat in D and so on.... These data files are changing every second, but i want to monitor every minute, not every second. I am running an app in Computer A in USA, that will need the data from B, C, D, E... at the end of each minute. Can i transfer files from B,C,D,... to A every minute using automated ftp? If you can do it how much is the total cost?Will you return the money back if it does not work? Can we talk over phone? Please let me know if the problem is not clear. Our software, Folder Transfer, can meet your needs exactly. You can set up a schedule to send files every minute from computer B,C,D,E... to computer A. In your case you need 21 licenses. The software offers 7-day free trial of full functionality, so please download and evaluate the program. Please make sure the software can meet your needs before you purchase. Even though we may offer refund option to our customers, it is not recommended to go through the refund process because the software is for full function free trial, and there are some unrefundable fees for each transaction. 1. We will develop the app and test the system in USA and at the end, it will be implemented in Bangladesh. Can we do it? 2. For testing in USA, we have 3 computers: A in DC, B in Boston and C in Los Angles. So I'll buy 3 Professional Edition licenses right now. The app will run in A.Can these 3 licenses be transferred in 3 computers in Dhaka later on? 3.Will your technical support walk me through the installation in one computer? 4. If I can talk to you over phone or chat online, i could get answers of all my questions in one session. Can i do it? Folder Transfer software offers 7-day free trial with full functionality (Enterprise edition), so you can test the program to see if it can meet your needs before you buy the licenses. Please make sure the software can work for you before you buy. The licensing method is on computer basis. Each license will be associated with one computer's hardware code. So each license cannot be transferred to another computer after it is used for registration on one computer. So, you may purchase 3 licenses of Professional edition firstly. Then you purchase other licenses for other computers later when you need. The software is easy for installation and use. You just need install and run Folder Transfer on computers you wish to transferred between. We are unable to offer telephone support due to the high volume of inquiries everyday and the time zone difference around the world. We can offer free email support, and will get back to you ASAP. another network of 67 computers. manual, i.e. Send , Receive etc. But on Vista, it does not show up. 1eb-77159d2 (XP 32 bit), but I could not transfer or share any file. on the success of this expt. If two computers can log in the same group, usually they can connect each other and send ans share files. Please let all the computers log in the group, and send screenshots of the program to us for further investigation. Each one of our customers is usually have few dozen or hundreds of our software products. The customers use to distribute setting or configurations files to all users in their company. I am now looking for some application that can easily distribute files to several user simultaneity in order to recommend our customers. I am using an old version of Folder transfer, which looks nice and might be very useful to our customers. But I have not yet evaluated the latest version of this file distribution software. Define groups- They want the ability to build group of users and then send specific files only to selected group (see explanation below). After you “Select all” and you want to remove some directory that already selected you must go one by one in order to remove the check box from all users (sometimes there are few hundreds of users) if you can add an option to unselect a folder that already selected that can be very helpful. Yes! Folder Transfer can exactly meet your needs. We just released a new version that can exactly meet your need, which lets you distribute files to a specific group of destination computers. Please upgrade Folder Transfer to the latest version.v 4.2.5.54. Run Folder Transfer -- Click "Jobs" -- click "Target PC Settings" -- Department -- Then you can create departments there. 2. You need group the target PCs (Let those destination computers to join a department. Additionally, there are other new features that are convenient for users to distribute files to multiple computers. For example, you can set default receive path for destination computers from one source computer. So you can easily specify which destination folder you wish to send files to. And you also add a nickname for each destination computer so that you can easily identify the computer users. Folder Transfer v4.2.5.54 has been released! The file transfer software is for PC to PC via LAN or internet, what if i just want to transfer files in the same PC but between hard drives (e.g. internal hdd and external hdd)? can i see in between folders which one has more files or which files are the latest ones? Folder Transfer currently is for file transfer between two PCs. not for between hard drives inside one computer. You need to purchase 5 licenses to share and transfer files between 5 computers. Here are the answers for your questions. 1. Yes. You can select multiple computers as tartget computers at a time. After you click "Send Files to ..." and select files you wish to send, and you may click "Select Online" when you select target computers, then you will select all online computers, and send files to them. BTW, do you have a need to send all computers including offline computers on which Folder Transfer is not running? If yes, Folder Transfer has this feature in the latest version to let you select all computers including those offline computers in order to send files to them. When those offline computers run Folder Transfer and connect to your computer, then the file transfer job will automatically be executed. 2. Yes. You may just purchase Enterprise edition on the computer you use to send files. And you may use free version on computers you use to receive files only. However, you will get messages on those computers to ask you to upgrade the software. This is a great software to transfer folders. I could transfer few folders yesterday but today I am unable to do so. The status of other connected computers shows offline today. 2. current status shows offline. how to set it online. You must let those Offline computers run Folder Transfer program again, then their status will become "Online" again. When they are online, you can resume the paused file transfer jobs. Please note that Folder Transfer is a Peer to Peer file transfer, the file data will not go through our server or third party server. So you must make sure both source computer and target computer are running Foler Transfer program at the same time in order to transfer or share files. A brand new version of Folder Transfer software, v4.2 has been released recently. The new version file transfer and file sharing program has new features with more reliable performance, especially for usage scenarios in transferring many files to multiple computers on network as well as compatibility with more enterprise-level routers including Symmetric NAT routers. Reliable performance in sending multiple files and folders to a couple of computers simultaneously. Option to select "All Computers" when choosing destination computers no matter the computers are online or offline. (When the offline computers run Folder Transfer and set up connection, the file transfer job will be executed automatically. Please download the latest version of this great file transfer and sharing software tool to send or share files with your colleagues and friends. Coding Best Software is pleased to release an Enterprise edition, which is a file transfer messenger to allow users to send messages to each other during file transfer or file sharing. That is, a Folder Transfer user can message other Folder Transfer users when they are running the program. This feature is very helpful for a team to work togehter and need communication. especially when they transfer documents or share project materials at work. WIth the Enterprise edition, you can send messages from one pc to another pc, or send text messages to everyone, who are online. The new feature empowers the software to be a kind of live chat messenger (MSN messenger-like tool). When you transfer files to your colleagues or team members, you can chat with them online immediately if they have some confusions about the files you are sending or already sent. This file transfer messenging software let the whole team work more efficiently. This feature will offer you a convenient way to share files and folders on network. You maybe want to set up shared folders on network to let other network users to copy the files from the shared folders. Especially, sharing large files will be an convenient way for colleagues to get what files they need at work. It seems to be an easy case for Windows users. However, it is not true. Usually, folder or file sharing across Windows computers will cost you much time to make things done, and sometimes it will bring you some trouble. Because usually there are different Windows systems on a computer network, you have to handle with different folder sharing setup method for different Windows versions. And privilege or permission of the user account to read or write files is also a key issue to share and copy files on a Windows coputer network. A network adminstrator often spends a lot of time to find out "why it doesn't work" to make folders shared on a Windows PC. Is there a simple software program to share big files over network without doing tedious work? Please try Folder Transfer 4, which is an easy way to share large files and folders on network. You just need to run the folder sharing software on each computer, and each computer user can share files and let other users to download. 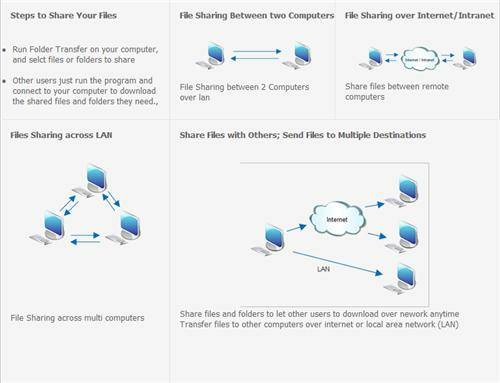 The folder sharing program can work for both LAN (Local Area Network) and Remote Network(Internet). For computers on the same local network, you don't need to take care of the network connection. All connections will be made automatically. For remote network file sharing, you can use "Join a Group" to let all comuter users to join a same network group account. Then you can share files across remote network, and other users can download the shared large files over Internet. How to push files to multiple network destinations? With Folder Transfer 4, you can push files to multiple locations simultaneously as long as Folder Transfer is running on computers on those locations. No matter computers are connected by LAN (local area network), or Internet, or they are across multiple networks, it will be very convenient to transfer files from computer to computer over network. Here are the steps to send files to multiple computers at the same time. 1. Run Folder Transfer on each computer simultaneously on different locations. Definitely, you also need to run the file tranfer program on your computer where you want to transfer data to other computers. 2. If all computers are on the same LAN, they can be connected together automatically, and you may go straight to proceed with step 3. Otherwise, you need use "Join a Group" feature to connect remote computers. Firstly you need sign up a group account, and then let all computers to join the same group. It is an easy way to transfer files to multiple computers over Internet or across multiple networks. 3. On your computer, click "Send Files to ..." button in the Send Tab of the program, select the files and folders you wish to send. Then click "Next"
4. Select multiple computers to receive your files and folders. You may even select multiple destination directories on each target computer. Then click "OK"
That's it! This is a very simple way to push files to multiple network computers even when they are connected by Internet. Of course, if you need to make automatic file transfer every certain time interval or on a shedule basis,you may also click "Next" in step 3, and set up a schedule to send files to multiple PCs on your network. You may also set up a file filter to select specific files to send files to multiple networked computers. * Faster data transfer speed. The file transfer speed is much faster no matter you use this tool to send files over LAN or Internet. * More reliable remote network connection. The new Folder Transfer software use a new advanced remote network connection. That is, the "Join a Group" feature will work more reliably and it doesn't require a UPNP router. * More Secure. All data are transferred at data block level. When transferring files betwenn computers, each user can set up Security IDs. If you want to transfer files from pc to pc, you need know the other part's ID if the other part set up the security ID..
* A great new Interface and easier to use. You can transfer and share files more efficiently. Please go to the download page to try the new version of data transfer appliaction. Folder Transfer is the best free LAN file transfer software transfer and share data over local area network. The program lets you conveniently connect computers across local networks and perform local file transfer between LAN computers. No matter the hard drives or folders on your networked computers are network share or not, you can easily backup to another computer over local network. The handy file transfer utility is widely used by both business and individual users on their local network areas, including office LAN and home network connected by wifi network (WLAN). Please download this powerful lan file sending software from pc to pc and get an absolutely free version. You can send files to multiple network computers at a time. Folder Transfer is not only an lan to lan file transfer software, but also an effective tool for remote networks. Many companies need do remote file transfer especially when their staff need work in differnet locations or they have offices in different cities. Most file transfer software products require their users to provide the IP address of the remote location, so the network configuration or setup will be very complicated when you use these programs. Folder Transfer provides a great remote network connection solution to solve this issue, no matter you want to connect two LANs in different locations or connect two remote computers directly. Folder Transfer has a feature called "Join a Group" which is a network connection mode that can easily help you connect remote computers by creating a network group. The users just need to sign up and login into a network group, their computers can connect together and perform remote file transfer and don't need know the IP address of the other network users. Certainly you may use another network mode, "Connect to a Computer", to connect two computers by entering the remote computer's IP. So Folder Transfer is a network file transfer software program for both WAN and LAN. In fact, two above network modes can also be applied to LAN backup, particularly when network computers are not in the same local network range. These two network connection methods will help you transfer files between computers across multiple LANs while you don't need to set up a lan transfer server. As we know, there are many lan file transfer software products in the market. But not all local network file transfer programs can work reliably and conveniently. And some lan file transfer solution are very expensive. Folder Transfer can meet all the local file transfer needs and work for most computers and storage devices on LAN, including external hard disk, USB drives, network attached storage, network mapped drives, and network shared folders. In addition, it is a free lan file transfer program that allows users to send data without size limitations, and you can get free trial of all the features of the Professional and Enterprise versions in the freeware version. Folder Transfer, the great data transfer tool for LAN, is affordable and widely used in office and home network. Please do not hesitate to get free download of this LAN file transfer software to install in on your local computer network. Need to move files fast? Want to send files to a second computer across the network? Folder Transfer is fast, easy network file transfer between computers. Use this powerful program when you are upgrading to a new computer, or when you want to quickly move documents, photos, music to another laptop and or PC. Folder Transfer will save you time and money. It is a professional file transfer software to let you transfer files from one computer to another. You can send files and folders to multiple computers at a time. In addition, Folder Transfer is also file sharing tool, which allows you to share a file or folder, and let other network users to download over the network. This file transfer program has two network connection modes: Local Network and Remote Network. In the same local network, Folder Transfer will let computers connect together automatically. Every user can see other networked computers in the main file transfer tab of the program. You can send files to another network PC easily by dragging files into the targer computer. Folder Transfer is a simple local network file transfer software to let you transfer files to another network computer even though you don't have permissions to read and write data for any folder on that network computer. Folder Transfer can also be your remote network file transfer software. You may send data to another remote computer over the Internet. There are two network connection ways that you can perform remote file transfer: "Join a Group" or "Connect to a Computer". You can send files to other remote locations over the Internet by using Folder Transfer, which is an easy to use remote file transfer software product. In fact, you can not only implement point to point file transfer, but also do file sendings among multiple computer. You may transfer data to more than one computer or location at a time. So Folder Transfer is a very flexible network file transfer program. And its free version also offers free trial of all features in the Professional and Enterprise editions, which can evaulate how the software works for both local network and remote file transfer tasks. As we know, data transfer is a very important routine task everyday in office. No matter you want to transfer files to another pc or share important data with your workmates, you must find a pc data transfer tool that can meet the following criteria to ensure the file data transfer job is reliable and easy enough. First, the pc data transfer program can send data to multiple destination over the network so that it can fulfill the work requirements in different scenarios. For instance, you can use one PC in your office and another at home, etc. In such case you probably want the files you work with to be the same on all the computers you are using. Here you need run into the task of transferring files between home and office company over remote network with Folder Transfer software. Second, the pc data sharing software should share your computer files and folders between two PCs. You may use file sharing all the time to ensure that your colleagues have access to some critical files or your friends can share your photos , music and video. It is a very simple and user-friendly file sharing tool built for people who need to transfer files from pc to pc regularly. So you need remote or lan file sharing software to always share data between computers or between the source location and the target location. Third, easy-to-use is a very key issue for any software product, especially for those software programs which are called "best". No matter you update to the higher operating system or just change a new computer, files transferring is an essential and necessary task. In the old computer, there are many important files like favorite bookmarks, family traveling photos, music or video collection etc. We need them, we have to move these files to the new PC. It is hardly practical to manually "Ctrl+C" the files from the old computer and "Ctrl+V" them to the new computer, especially when you transfer large files, because it will take you lots of time. If you don't want to waste the whole day to handle the huge task, Folder Transfer will be a good choice, which can easily transfer files from PC to another PC over local or remote network. In the same local network, Folder Transfer will let computers connect together automatically. Every user can see other networked computers in the main Transfer tab of the program. You can send computer files to another network PC easily by dragging files into the target computer. Folder Transfer is a simple local network backup software to let you transfer files to another network computer even though you don't have permissions to read and write data for any folder on that networked computer. Folder Transfer can also be your best remote network file transfer software. You may transfer data to another remote computer over the Internet. There are two network connection modes that you can perform remote file transfer: "Join a Group" or "Connect to a Computer". You can send files to other remote locations over the Internet by using Folder Transfer, which is an easy to use remote file transfer software product. In fact, you can not only to implement point to point file transfer, but also transfer and share files among multiple computers. You may backup data to more than one computer or location at a time. So Folder Transfer is a very flexible network file transfer program. And its free version also offers free trial of all features in the Professional and Enterprise editions, which can evaulate how the software works for both local network and remote file transfer tasks. Would you like to replace your old computer with a new one? If the answer is positive then you need to transfer files from your old computer to your new computer. But how could we do it without the tedious process and wasting too much time? To answer this question we should first introduce you a powerful file move and sharing software – Folder Transfer. Folder Transfer provides a safe and fast solution to transfer the valuable data to another computer, and also share your computer files with other networked users. Folder Transfer is very easy to use. You just install and run the software on computers, then drag and drop (select) files or folders you wish to transfer or share. Auto file transfer will be immediately completed and other networked users can download your shared files. Folder Transfer offers free edition which allows users to send no more than 50 files in a folder. Each files size will be limited with 10MB. You can upgrade the version to a paid edition to lift the limitations at a reasonable price. Then you can send unlimited files with unlimited size. The powerful pc file transfer software is a great program to let you transfer and share files between computers, and also a good supplement to other file transfer products. If you use your laptop or desktop for different purposes or in different locations, then often the files on the two systems are different. You can move the files from one location to another location so that the files is always consistent on each computer. This is helpful because you do not need to worry about transferring files individually or worry about what files you need to transfer to the other machine. Transferring files between computers doesn't need to be frustrating. Folder Transfer is a free folder to folder transfer software that will help you easily copy files to local or remote computers and also share your files to let other networked users download anytime. With this powerful folder sender and file multiple sharing software, you can access and share your files anywhere. How to Transfer Files between Computers? * Download the latest version of Folder Transfer from the Download page. * Install and run the program on both computers. * Select destinations you wish to send files to. (You may select multiple destinations.) Then complete files sending. Get started right now to check the working features and functionalities. If satisfied then puchase the powerful file easy sending and sharing software at an affordable price. Nowadays nearly everyone needs to use more than one computer. Maybe you use a computer at home, and one at work. Maybe you have a desktop computer at home, and a notebook computer when you travel. Or maybe you have all three. At one time or another, you are going to need to move files from one to another. You might be required to bring work home from the office on occasion. Or maybe you just want to share your MP3 collection with your friends. No matter the reason, you will need to copy files from one computer to another at some point. The simplest way to send files on network is to use special software can transfer and share files quickly. But which file transfer for pc is the best? While there are a lot of pretty good programs, there is one that has amazing options for computer users. The program is Folder Transfer. With such a wonderful software you won't have to do a lot more than drag and drop (select) files or folders you wish to transfer or share, then auto file transfer can be completed and other network users can download your shared files. You can transfer all files, especially large ones to another computer over network. Sometimes you have to send big folders to other PCs or download the big files from other computers via remote network,some hard drives or USB devices can not contain such huge size in their drives space. However, Folder Transfer can do that. No matter how big the files or no matter how many files you send, you can feel free to transfer the desired files. Moving large files between computers will become easier and faster. When you buy a new computer or notebook, probably you will want to transfer files from the old computer to the new one.You can free download the 100% free file transfer software on your computer or laptop. The program software is developed for operational system Windows: Windows XP, Windows Vista, Windows 7 and Windows 8. Try to use this powerful software and transfer files between computers. Have you got lots of important files and want to send them to your workmates? Or do you need an easy way to quickly transfer files from your old pc to the new machine? The simplest way to transfer files is to use special software that can instantly send files to another computer. With such software you won’t have to do a lot more than drag and drop(select) files or folders you wish to transfer or share, then auto file transfer can be completed. But which file transfer for pc is the best? While there are a lot of pretty good programs, we found the one that has amazing options for computer users. This program is called Folder Transfer. What free progrom can link files to another computer? If you want any way to transfer large files pc to pc, please download this free software to send files to multiple computers in seconds. Unlike other programs that transfer files, Folder Transfer instantly enables you to quickly transfer files from one computer to another at high speed. Sending files is as easy as selecting what data you want to transfer. In addition to send pc to pc files, you can use file sharing all the time to make sure that your colleagues have access to some critical files or your friends can share your vocation photos anywhere at anytime. File sharing pc to pc gives you convenience and let you easily connect with your colleagues or friends even though you are in different places. It is really helpful and neccessary. When you buy a new computer or notebook, probably you want to transfer all important files from the old computer to the new one. What is the most simple way to transfer huge amount of files and folders from the old PC to the new PC? It is quite annoying to move thousands of files from the old computer to the new PC by using USB or an external hard drive or copying files to another network drive. Is there a very convenient method to transfer files from your old computer to your new computer?Folder Transfer will be the best way to do that. You need add files or folders you wish to send to another computer, then select destinations you want to send files to. The software will start to transfer automatically. Thanks to Folder Transfer,you can easily send big files to another PC. Sometimes you want to send big files via Email, but some email platform would not let you send huge size file to another PC.There fore, emails and other transfer tools are not a good choice for you. Folder transfer provides you with the most simple way to transfer files between computers via LAN or Internet/Intranet, VPN. With the flexible remote internet connection method, you don't need to know the remote computer's internet IP address on the internet and its port number. 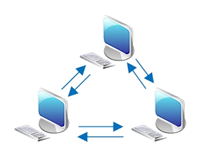 All the computers can connect together by joining the same network group, then they can transfer files between the network group members. Definitely, you can also input the remote computer's internet IP and port number to set up the remote network connection, then remotely transfer files between computers via internet. If you are looking for a reliable solution to share and download files from another PC, why not choose Folder Transfer?Just need some simple steps, you can share your computer files at once. If you are on holidays and want to share your happiness and joys to your friends, Folder Transfer is quite suitable for you. No matter where your friends are, they can easily download your photos,videos,music,etc.Your joys will be shared via network even though you are in remote places. With Folder Transfer, you can share and obtain the required files, which is much more convenient than fax or email. If you have ourchased a new computer, there are chances that you might want to transfer the data on your old computer onto this one. Transferring files from one computer to another can sometimes be a tricky task. There are a couple of options available. It will all depend what have you have available to you. Folder Transfer here is a useful tool that allows you to connect to your partners' computer, and transfer fast and secure any file or folder. Folder Transfer is the best way to transfer files from pc to pc no matter you want to transfer files from desktop to laptop, or transfer files from laptop to desktop. If you are a salesman in your company who need get new product materials from your manager's desktop, all the files are in a same folder and are updated every month, what is the best way to transfer files from computer to laptop? Try Folder Transfer ! It is a file transfer freeware to help you transfer files from one laptop to another laptop, especially send large folders over the internet for free.You just need to drag and drop the folder into the software, and select the destination computer you wish to transfer, all files will be transferred automatically. No matter your network computers are connected by ethernet cable or wireless wlan router, Folder Transfer can help you easily to transfer files from pc to pc. If you’re considering using Folder Transfer you should check out the below links for helpful advice. Most file transfer solutions are too complex. Too many features, too many buttons, too much confusion. Folder Transfer solves this problem by giving you a low cost, easy to deploy solution that can help you easily and instantly transfer and share files between computers . If you still do not have Folder Transfer, get it today! How to send large files pc to pc? How to share folders or files from one computer to another? What program will easily transfer folders on a schedule? Our software Folder Transfer will help you transfer files between two computers easily and effectively. Folder Transfer, is a reliable and powerful file sender software for PC which allows computer users to easily transfer files between multiple computers, such as a desktop and laptop, a home and work computer or a local computer and a remote computer. You can also share your computer files and folders so that other network users can download anytime. Just give it a Try before you purchase! What are the amazing features of Folder Transfer? - Copy files and folders from a remote computer to the local one or the other way around. - Move files and folders from or to a remote computer. How to send files from one computer to another? - Install and run the software on computers. - Drag and drop (select) files or folders you wish to transfer or share. - Auto file transfer can be completed now; other network users can download your shared files. Folder Transfer is definitely excellent for those who are searching for an easy, budget-friendly and automatic file sender software. It includes a lot of choices to assist your file transfer be as effective as feasible. Since Folder Transfer makes file transfer and file sharing simple and easily accessible for everybody to comprehend, we have huge fans. If you want a tool to automatically move files between computers and send big folders free, you'd better try Folder Transfer! Like best file sender software for PC? Folder Transfer can fully meet your needs! Go to download from http://foldertransfer.com/Download.asp and have a free trial experiece. Like free compute to computer file transfer software? Why not try the best file transfer for pc here! Folder Transfer is the leading file transfer and sharing software from pc to pc. Go beyond traditional file transfer softwares to deliver a better, more personal experience that your customers will remember. When you need Folder Transfer? When you buy a new computer, you will want to transfer most of your existing files over to the new computer. A lot of people, who spend their time gathering vacation pictures and family videos, will want to make a big move leaving nearly nothing behind. Moreover, some documents they're still working on and a few application installations they'll be needing shortly. No matter how much you plan on taking along, you want to do it quickly. Spend the minimal amount of time before you can cut that old hardware loose. There are a number of ways to do this, but the best and most easiest way is to use Folder Transfer! Folder Transfer is among the very best unrestricted backup suppliers. Our service makes file transfer to multiple destinations simple due to the fact that of our simple installment, a lot of transfer choices and fast file sharing. Give a free try right now! Setting up Folder Transfer is unbelievably simple. Go to download the latest version of Folder Transfer from the Download page and install on each computer of the network. It takes around several mins to totally set up the software application, make folder choices and start to transfer files. Sending files with Folder Transfer is quick and automatic. Right away follow the Online Manual then you can make fast and easy file transfer. Preliminary file transfer takes a while depending upon how many files you are sending to. We suggest just picking necessary files to send. It is not good to send huge files at a time. The share attribute is simple to make use of with Folder Transfer. You can quickly create shared folders and files to let other network users download anytime. You can share all your private or business information with friends, clients and colleagues. Folder Transfer stores all your data and makes it available to you anytime you want it, anywhere you go, on any computer you have. You can encrypt file transfer with a pre-set password so that only computers with the same security ID can be connected together. It is neccessary for any users to obtain encrypted files. Folder Transfer is definitely excellent for those who are searching for an easy, budget-friendly tool to copy files across folders. It includes a lot of choices to assist your file transfer be as effective as feasible. Since Folder Transfer makes file transfer and file sharing simple and easily accessible for everybody to comprehend, we have huge fans. How to send folders from one computer to another? How to transfer large amounts of data remotely?Do not waste your time searching for a free computer to computer file transfer software: you have already found it here! Folder Transfer is the best software to transfer and share files between computers. If you are seeking a software for data transfer between computers. Please download the software for free trial. It offers a simple and secure way to transfer personal files and business documents, securely share files with colleagues and friends. It is very useful letting you automatically transfer files between multiple computers. You may download it to any computer on your network no mattter it is your desktop or laptop computer. You must install Folder Transfer software on at least two networked computers in order to backup files between computers. When you run Folder Transfer app on the two networked PCs, you will see two computers to go online on the main window of the program. Then you can start to transfer files between two computers. You need add files or folders you wish to send to another computer, then select destinations you want to send files to. The software will start to transfer automatically. All transfer items will be updated automatically every a certain time interval that you can set.That is, you can set how ofen you want to send files again. Folder Transfer is a permanent free network to netwok file transfer software proudct, which can transfer your files, especially large files from one computer to another over the network. If you want a free software for copying large data files fast across network, Folder Transfer can be your best choice! After setting up the remote network connections between computers, you can transfer your files and folders over network (Internet or Intranet or any network access) to any remote destinations your computer connect to. Is it safe to send data remotely with Folder Transfer software? Yes! This network to network file transfer solution is designed for pc to pc file transer. That is, all your data will be transferred between computers without going throgh our server. You can also set a security ID number for the network transfer. Any other network users are unable to connect to the private network if they don't know this ID number. Yes. The remote network file transfer tool can support breakpoint transmission, so you don't need worry about network connection interruption. Is the remote network file transfer application free ? Yes! Folder Transfer is a network to network file transfer freeware. The free edition is permanently free and good enough for personal use. It is recommended you register the professional and enterprise editions because of unlimited transfer size. Folder Transfer is one of the best free remote network backup softwares. Actually, it is also useful for local network file transfer. How to transfer files on a home network? Try the permanent freeware now ! Folder Transfer is the best point to point file transfer and sharing software designed for all Windows platforms including Windows 7 and Windows 8. It makes fast transfer of your data files to another directory, internal or external hard disk or to a computer across the network. How to copy files between computers connected by lan network? Do you want safe and free moving files from pc to pc? Folder Transfer can fully meet your needs. It is the fastest utility to move bulk files from one pc to another over local network or Internet/Intranet. You can also share your important files and folders to let other networked users download anytime. What is the best and most reliable file transfer software for network? Start using Folder Transfer today to backup and share files between computers over the network. Where to download the free program for file transfer and file sharing between computers? Download here and get started to try the software now. Easy-to-use file backup wizards guide you through the entire file&folder sending process. Easily choose to send individual files, folders, drives or entire systems. Files and folders can be easily transferred to another computer. No matter your file size is 4GB or over 5GB, Folder Transfer will allow you to send unlimited large files to any computers over the internet directly. You don't need to send large size files to a third-party cloud storage service provider. Share your files, and let others download them anytime. What file transfer progrom should I use? We often need to transfer large files to our colleagues, customers and friends. Maybe you want to share your birthday party video or wedding video with your friends. But the video file is very large. How to transfer those monster files? What program should you use? There are many, but the best is whichever one that you'll actually use. Among so many file and folder sending programs, the best free file transfer and sharing software for pc we will highly recommend is Folder Transfer ! It is suitable for large file transfer, which can help you easily and quickly transfer large files. You no longer need to transfer large files via FTP site or via email. You just need to drag and drop your large files into Folder Transfer, then your friends can download the files you have shared. Do not hesitate to try the best file transfer software to transfer files and share files from pc to pc! Folder Transfer is a step-by-step guide for transferring files ,photos,music or other documents between multiple computers via LAN or remote network. Plus,it helps you send large files and folders over Internet/Intranet. You can use this auto network file transfer program to remotely send files to multiple destinations at a time. Try Folder Transfer, which is one of the best internet file transfer software that can send files via Internet or other remote access like VPN, Intranet, WAN. And both the single file size and the total file size you can send will be unlimited if you use Enterprise edition of the software that is the cheapest in terms of pricing. No matter you are going to send a video file or a folder with photos to your friends online, Folder Transfer is the best tool to send files! How to Install Folder Transfer ? 1.Download the latest version of Folder Transfer from the Download page. 2 .Unzip the download package and double click "folder transfer_Setup.exe" to get started. Then click "Next" in the coming "Welcome to the Folder Transfer Setup Wizard" interface to continue. 3.Click "Next" to continue in the "Select Destination Location" interface, and setup will install Folder Transfer into the default folder. If you would like to select a different folder, click "Browse". 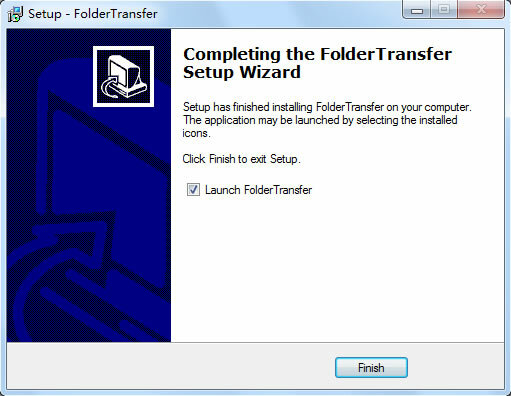 4.Click "Finish" in the last "Completing the folder transfer Setup Wizard" interface to exit Setup. How to Send Files and Folders? Why you need Folder Transfer? You may need to purchase so many USB device or portable hard drives,but they are the traditional transfer methods.In modern society ,you need a brand-new way to help you transfer data from PC to PC.If you are running a company,you may transfer huge amount of data from time to time,traditional methods can not meet the increasing data nowadays yet .Therefore,you may try Folder Transfer .Folder Transfer has the ability to transfer any files from PC to PC via intranet or remote network.Even though you are abroad ,you can still download documents from your office laptop or your colleague computers.In addition,you do not have to carry such a heavy device with you to other places .Folder Transfer charges little money but provides greatest function,everyone likes it . 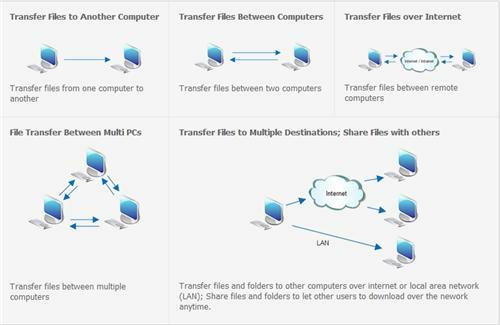 You may find difficulty to transfer files from PC to PC via LAN network or from hard drives to another computers.So,which is the best LAN file sharing tool?Please try Folder Transfer.Folder Transfer is a free program that allows user transfer files and data from PC to PC via local network and remote network. What is Folder Transfer ? Folder Transfer is a free, user-friendly and compact network software specially intended for users who want to remotely send data and transfer files between multiple computers.You do not have to pay so much money on transfer device which means you save the budget of your business .Plus,everyone can use this software because it is so simple ,just like a piece of cake. Its interface is very attractive because of its well-organized menus and options. You can easily view, manage and organize all the available computers and select the ones you are interested in from the main window.There is no other sophisticated options in the transfer window,just a few buttons,the transfer task can be finished. Folder Transfer can let you transfer big files between multiple PCs,you do not have to worry about the size limitation about transfer. Sometimes you have to transfer or download the big files from other computers via remote network,some hard drives or USB devices can not contain such huge size in their drives space.However,Folder Transfer can do that.Now matter how big the files or no matter how many files you send ,you can feel free to transfer the desired files . Folder Transfer provides you with a data transferring bridge.How to do that?You can join a group between your friends and family.Get together with your family members,just need to put a group name,a password in the box.After connecting the group,you are all the sharing members that you can share any files(music,photo,mp3,pdf,documents,etc. )any time and any where. When you run Folder Transfer on your computer for the first time, it will automatically connect to other computers where Folder Transfer is also running across LAN. So, if all your peer computers are in the same local network, you don't need take any action for the local network connection setup. You just need run Folder Transfer on each networked computer, then you can transfer your computer files onto other computers over the local network. Why file transfer is important? When you buy a new computer or notebook, probably you will want to transfer files from the old computer to the new one. What is the most simple way to transfer huge amount of files and folders from the old PC to the new PC ? It is quite annoying to move thousands of files from the old computer to the new PC by using USB or an external hard drive or copying files to another network drive (it will occupy huge disk space on another computer's hard drive. Is there a very convenient method to transfer files from your old computer to your new computer ? Folder Transfer will be the best way to transfer files from a old PC to a new PC. You just need to select the files and folders you wish to move to the new PC, then select the new computer name in the software program window, all the files will be transferred fast. Transferring folders and files to a remote computer via Internet usually brings you trouble because you don't know the remote computer's IP address. However,Folder transfer provides you with the easiest way to transfer files between computer over Internet, Intranet or WAN. With its advanced network connection methods, it is not required for you to know the remote computer's IP address or port number. all the computers can connect together by joining a same network group, then they can transfer files between each other. Definitely, you can also input the remote computer is IP or port number to set up the network connection, then remotely transfer files between computers. Do you want to share files in a preferential way?Do you want to transfer a folder via the internet and intranet ? Download Folder Transfer ! Frustrated with less space due to crammed disk with ever-changing data stored on it? Hope to transfer files from old PC to a new one or transfer folders from one computer to another? Anything like that brings a question: how to transfer files and folders from one computer to another and what is the safe and quick way? Actually, with storing increasing amounts of critical data on the hard disk, transferring files from pc to pc can be a challenge without the right file sending programs. Thankfully, here comes a free software to quickly transfer all your important files PC to PC without hassle. It is Folder Transfer! Folder Transfer - an effective and powerful real time data transfer software, which makes file transfer in pc much easier and allows you to transfer files and folders, especially large folders, to multiple computer simulaneously over LAN or remote Internet/Intranet. It also lets you share your computer files and folders to let other network users download anytime. It is considered to be the best file transfer PC to PC software, with an easy to use sequential file transfer wizard that will guide you through the complete process to transfer files and folder from PC to PC. What is the best and fastest way to copy files between two windows computers without FTP? Start using Folder Transfer today to transfer files from pc to pc. Where to download the free file and folder transfer? Download here and get started for free! Can't see full features of Folder Transfer? Can't find how to transfer files from pc to pc faster? Check out our Online Manual page for more information about how to use file and folder sender. How to send files larger than 3gb for free? Are you seeking a software of data transfer by lan cable? Are you looking for any send software free download? Do you want a free software for transferring files from pc to pc? Try Folder Transfer, then you can use this free file and folder transfer software to transfer files from one pc to another, or send files to multiple computers no matter they are located in your office LAN , home network or even corporate remote networks! If you need features including backup+sync+file transfer, please try Backup Cow, a sister product of Folder Transfer..
Folder Transfer is a sister software of Backup Cow.If you are seeking for a widget to transfer and share files over intranet and internet from one to another,Folder Transfer can help you.It offers strong features,such as sending big files from PC to PC,sharing and downloading files from another computer,or achieve network connection,etc. You may find difficulty to send big files to another PC.Thanks to Folder Transfer,you can do it easily.Sending files and folders to a remote computer over Internet usually brings troublesome to you because you don't know the remote computer's IP address. Another trouble is that sometimes you want to send big files via Email,but some email platform would not let you send huge size file to another PC.There fore,Email and other transfer tool is not the best choice for you. Folder transfer provides you with the most simple way to transfer files between computers via Internet or any WAN :Intranet, VPN. With the flexible remote internet connection method, you don't need to know the remote computer's internet IP address on the internet and its port number. all the computers can connect together by signing in a same network group, then they can transfer files between the network group members. Definitely, you can also input the remote computer's internet IP and port number to set up the remote network connection, then remotely transfer files between computers via internet.Moreover ,it lets you open folders with Windows Explorer (Explorer) and run the file directly. If you are looking for reliable device to share and download files from another PC,why not choose Folder Transfer?Just need several simple steps,you can easily share files from one computer to another.If you are on holidays,you want to share your happiness and joys to your friends.Folder Transfer is quite suitable for you.Your friends in any places can download your photos,videos,music,etc.Your joys will be shared via network even though you are in remote places.If you are a CEO in abroad ,but you forget to bring the important document with you,you can use Folder Transfer to solve problems.In this software,you can download the desired files from remote network,which is much more convenient than fax or email. Folder Transfer can make all computers connect together by joining a same network group.In this way,all users don't need to know each other computers' IP addresses and port numbers.You only need to create a remote group account,then all remote users can log in the same network group. If you have some neighbor computers (laptop and desktop),you can ask them for the IP address and port number. Just directly input the IP address and port number of the remote computer or remote network.There you can connect to the remote PC or the remote network. Generally,you can set up the computer name by yourself,every desired name can be set there,so that other people in your group can easily find you out.Secondly you can set the IP address and LAN port.As to the hint setting,you can choose which one you want.You can set "show hints when sending files","show hints when transferring is complete",or "show hints when receiving a file",etc .All these option can be customized . What benefits can you get from Folder Transfer ? No matter you are a manager in a company or a student at college,Folder Transfer will give you unexpectable surprise. If you are running a company with a few branches or divisions nationwide, you need to remote send files or data to those branch stores or remote locations every month. You may consider some issues when you are looking for a remote file transferring application to solve this matter. Some questions may be refrred to.For exmaple,What is the cheapest way to transfer data? How can I send a folder to another computer remotely ? How can I send big files easily within few minutes?How to transfer my files and folders to mutlple destinations at a time ? Can I tansfer my files over Internet without using any public cloud services ? The answer is Folder Transfer .It has powerful features to transfer data from PC to PC and share files between multiple computers via the same network group. Are you interested in Folder Transfer?Download and have a try now ! Are you wondering which way to transfer data is good for you?Are you concerning about the high price of transfer software?Do you want to transfer data from PC to PC easily?Folder Transfer is an advanced data transfer freeware,which support sending large files,sharing files from remote network ,sending files to intranet,etc. You are deserved to gain this reliable software .Download For Free! Folder Transfer can transfer files and data to multiple computers at the same time.Many people still use some kinds of device to transfer data,such as hard drive or USB .However,they are not as reliable as you imagine.The short coming of USB is that sometimes it be shut down with some malfunction,your data may have to re-transfer again,that means wasting time!Fortunately,Folder Transfer can solve this problem,it supports break-point transferring,so you can feel free to use this excellent software. Are you worrying about the size limit of your hard drive?Do you want to transfer big files from PC to hard drives when you need to change another computer?Folder Transfer lets you transfer large files from PC to PC,from hard drive to PC or from laptop to hard drive.Even through you want to send files to your neighbor computer ,it still works. Once you have taken thousand of beautiful scenery or pretty girls,and you do want to share them to your friends and family,Folder Transfer can help you to achieve that.With a strong feature in Folder Transfer,you can set up a group among your social cycle.You just need to create a group then they can download your files easily and without paying any fees. What benefits you get from Folder Transfer? No matter which model of computer you use,you can transfer data in a simple way.Folder Transfer can support most Windows platforms, including: Windows 7, Windows XP, Windows Vista, Windows 2000, Windows 2003,Windows NT 4.0.Take a team for example,they are doing a project,but some of them from different distance.Folder Transfer can help them to connect together.If you are a teacher,you want to share the tips of examination,you can use Folder Transfer to send files to your students.In this way,you can save a lot of time on transferring and improve the work efficiency. Transferring files to a remote computer via Internet usually brings you headache because you don't know the remote computer's IP address. Folder transfer provides you with the easiest way to transfer files between computer over Internet, Intranet .With its flexible network connection methods, it is not required for you to know the remote computer's IP address or port number. You can connect the network by joining a same network group,you just need to know the group name and password.Everything will works well then.People in the same group can transfer and share data simultaneously.In addition, you can also input the remote computer is IP or port number to set up the network connection.Therefore, Folder Transfer is the best program to transfer file from one computer to another PC via internet. Step Three:Click "Network"----"Join a group"
Let's enjoy the joy of transferring data from PC to PC.Free permanent try available !Do not heaste to share beautiful staff to your friends.Let's join a group now! Download now! I am currently in the process of buying a new desktop -- my old one has windows 7 and the new one has windows 8 --- will I be able to move everything over to the windows 8 system with your software? How to copy files files between two computers on the same network? How can I download huge data from my friends' computer? Are you looking for a free software for transfer of data from one pc to another over the internet?Transferring computer data from one place to another is a rather broad topic. There are many methods available, some of which are exclusive of each other, and some of which may apply to more than one situation. One of the best software for data transfer pc to pc is Folder Transfer! Folder Transfer is a free data transfer software built for people that need to transfer files PC to PC regularly. It also helps you share files, photos, music and video with your friends. Download Folder Transfer and get started for data transfer. How to send files between two PCs? How to copy files to multiple remote computers? Once you run Folder Transfer, you will think transferring your data is made easy with its east-to-use, step-by-step wizard. Unlike other programs that transfer files, Folder Transfer - best software for transfer online files, can instantly enable you to quickly transfer files from one computer to another at high speed. Transferring files is as easy as selecting what data you want to transfer. From now on, you can migrate hundreds files and folders by selectively choosing what data you want to transfer. Your new computer will look like your old computer, but without the clutter. Copying data to a new computer is the perfect time to choose what you do not want on your new computer. How to share files between two computer over the internet? Which is the best way to access remote computers for file sharing? Folder Transfer will be your best software for sharing files on lan or Internet/Intranet. You may use file sharing all the time to ensure that your colleagues have access to some critical files or your friends can share your photos without being chained to desks in a single room. Internet file sharing pc to pc gives you mobility and allows you to have connections with your colleagues or friends even though you are in different places . It is really helpful and neccessary. Nowadays, there are many data sharing utilities out there but some of them are too expensive to afford them. Folder Transfer is an exception tool, which is easy to use and free version is available! You can enjoy the permanent Free version or pay and upgrade to the Proffesional or Enterprise version at a really low-priced. How to transfer large files to a remote pc? Is there a free software to move bulk folders from one location to another? Yes, that's Folder Transfer! Transferring files, especially large files from one location to another has traditionally been a time consuming and somewhat painful task. But luckily, Folder Transfer has made large file transferring from one pc to another much easier and faster. With the free big folder transfer software, you can send unlimited large files to any computers over the internet at incredible speeds and with superb levels of security. Want to check feature details? Please view Feaures page. Data transfer is an integral part of business, but it can often pose a challenge. Employees constantly share files with colleagues and clients. Anyone who has tried to send large email attachments knows that errors often occur. Email clients are just not meant to handle big files. It is time for binesses to have a solution that allows them to quickly and securely transfer files. If you are looking for a free software packages to move files, why not try Folder Transfer? Here are some of the benefits you can get from it. Sending large files to multiple computers is a huge waste of time. Folder Transfer makes file transferrring and sharing practical and fast. Send large files of any size, type and quantity quickly. If the transmission gets interrupted for any reason, it will be automatically resumed. It has never been easier to send large files. Simply add recipients, drag and drop files and add recipients, then leave Folder Transfer on. Files will be transferred directly from yours to the recipient's computer. Transferring files is very fast. Your files are sent directly from yours to the recipient's computer using private file sharing technology. They are not kept on any servers. Only you and your recipients know what has been sent. You have complete control over your data. Try out Folder Transfer for yourself, and see how easy it is to transfer data from pc to pc ! Download Folder Transfer and try it out! How to automatically transfer files between two computers on a home network? How to copy data from one pc to another over internet? Please choose Folder Transfer, an auto Free File Transfer and Sharing Software! It goes right to transfer your files and folders automatically over LAN (Local Area Network) or over Internet (remote network access). You can use this auto file transfer tool to send files to multiple destinations at a time. Download Folder Transfer and get started to transfer files. Folder Transfer is a full-featured file transferring software for business or individuals, which offers a simple way to transfer files between two different located computers. How to send folders to another computer? Most people will often try to look for a solution to send folders by email like gmail, especially when they have a lot of files and folders to transfer. Unluckily, most e-mail service providers will not allow you to send a folder by email directly. You have to compress all the files and folders into a large email attachment. But too large email attachment is not allowed to be sent by email (e.g. more than 1gb). With Folder Transfer, you can easily send large files point to point without file size limitations. Even if your file size is 3GB or over 4GB, Folder Transfer will allow you to send unlimited big files to any computers over the Internet directly. You don't need to send big size files to a third-party cloud storage service provider. Are you often faced with the challenge of sending large files such as presentations, photos or videos? The standard way via e-mail places a burden not just on your mailbox storage, but often simply doesn’t work due to restrictions imposed on file size by the e-mail provider. With Folder Transfer's convenient and secure file sharing feature, you can easily and securely exchange files at your will. If you wonder, which is the best file sharing software b/w 2 pcs? Of course that's Folder Transfer! It is not only a file transfer tool, but also a useful file sharing software for you to share your computer files and folders and let other networked users download anytime over the internet or LAN. How to transfer and share files over internet? How to Receive Files and Folders? How to Download Shared Files? How to Register to Professional or Enterprise edition? ......>> More tutorials about Folder Transfer. Transfer All Files to A New PC with Folder Transfer - Best Free Auto File Transfer Software! If you recently purchased a new desktop. But you have no idea how to get all your files from your old laptop to your new PC without spending hours transferring them. Are there any free downloadable programs that would help in the file transfer between the two computers? Do I have to actually connect the computers via USB cable, etc? Maybe you are so completely clueless! At one time or another, most users have faces the daunting challenge of migrating data to a new PC. Your new PC won't truly be yours until it holds all your important data files and favorite applications from your old one. File transfer between an old PC to a new PC is pretty easy and straightforward, if the file size is small. But if you need to transfer large data to the new PC, it must be a formidable job. Here comes with Folder Transfer designed to simplify the process: Transfer and Share your files and folders from PC to PC over local network or remote network (Internet or Intranet). It is a freeware app for all Windows platforms including Windows 8, Windows 7, Windows XP, Windows Vista, Windows 2000, Windows 2003,Windows NT 4.0, which allows you simply to move large files, such as pictures,music, videos, etc between your old computer and the new one. If you are looking for an auto file transfer free download, why not try Folder Transfer? It is easy to use and free version is available. You can also pay and upgrade to Professional or Enterprise version at a affordable price. Don't hesitate and free download Folder Transfer now! How to share data pc to pc? How to automatically copy folders and files from one computer to another on the same network? Folder Transfer goes right to share your files and folders over the Internet (remote networks) or private LAN (Local Area Network) too. You can use this auto folder sharing software to let other users download your shared files from your computer anytime. In addition, Folder Transfer is also a file transfer software that can transfer files and folders to multiple computers over the network. Folder Transfer is a very simply and user-friendly file sharing tool built for people who need to transfer files from PC to PC regularly. It helps you share files, photos, music and video with your friends. This lan file transfer program and file sharing software eliminates the hassles of FTP and limitations of email file transfer especially for transferring large files. The simple interface makes transferring files as easy as dragging and dropping files. It can transfer files over the Internet or LAN/home network. Start transferring and sharing your data by downloading a free trial! What are the Key Features of Folder Transfer? * Folder Transfer is a network file sharing software for you to share files and folders and let other users download anytime over networks (Internet or local network). * It is a free software to assist peer to peer file sharing via ethernet. * Folder Transfer is also a file transferring softwate which enables you to transfer files and folders from one computer to another over internet or lan. * You can transfer files and folders to multiple computers simultaneously. * You can also transfer folders containning large size easily. * The free tool can support breakpoint transmission and you don't need to worry about network connection interruption. How to share your files and folder? It is easy to use Folder Transfer! Step 1 Run Folder Transfer on your computer, and selct files or folders to share. Step 2 Other computer users just run the program and connect to your computer to download the shared files and folders they need. For more information about how to use this free tool for sharing folders, please view the Online Manual. In today’s data-driven enterprise, there is no limitation to the type of information that is shared between employees, business partners and clients. A business manager must be able to share a training video with his or her new employee. A construction company must be able to share blueprints and specs with subcontractors. A photographer must be able to share wedding albums with the happy newlyweds. However, most people are always limited by the type of files or file sizes when they want to share something with others. This is a problem often felt with traditional and old-fashioned data sharing softwares. With Folder Transfer , Transferring or Sharing your important files with clients or colleagues is as simple as sending an email. - Have you ever left an important document at home, and wished you could reach through the Internet from work to retrieve it? - Do you want to share your photos with your friends? - Do you want to share your favorite music with your friends? - Do you want to share those large files when you export videos or pictures from your digital video cameras? - Would you like to share more file types other than pictures? - Do you want to share some files with friends but want block anonymous access? If your answer is "Yes" to at least one of these questions, Folder Transfer is the best Folder Sharing Tool for you! 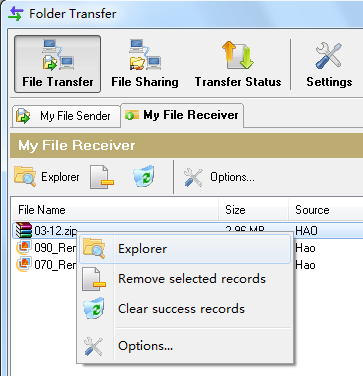 If you are looking for a lan file sharing program, why not try Folder Transfer? It is easy to use and free version is available! You can try the free version or upgrade to Professional or Enterprise Edition to get rid of some limitations in the free version. From now on, you can use this free folder sharing program to share files and folders, perform wifi transfer pc to pc, or send files to multiple computers no matter they are located in your office LAN , home network or even corporate remote networks. Download Folder Transfer and see yourself what this free tool for file and folder sharing can do for you! Folder Transfer lets you transfer files and folders from PC to PC via LAN or remote network,besides,it enables you to receive and share files to mulitple destinations.Easy,free and useful,that is Folder Transfer.Free Trail Download! Are you suffering from slowly transfer?Are you considering how to send large files(over2gb or 3gb) and folders to another PC?Are you thinking of which software to transfer files?Folder Transfer can solve all these problems.Why?With Folder Transfer ,you can send big files becasue there is no size limitation.Moreover,you can manually setup the transfer speed.Lastly,when you transfering files ,your PC won't be slow down,which is quite satisfactory. How to send files from PC to PC via LAN? Imagine when you are on holidays,you want to share your joy and happiness to your family or friends.How to do that?Folder Transfer can help you.It allows your friends to download your pictures,music,video from remote network.By Folder Transfer,you can share files or folders to mulitple destinations via remote network,which takes little time.Folder Transfer can be an excellent transfer tool to you! 1.Click "Receive Files From Network Computers"
There is an excellent feature about Folder Transfer----Join a group.If you want to send files to multiple destinations,you may create a group to make it come true.Why is this so useful?Since it is absolutely secure and efficient.When you create a group,you have your own password so others won't be able to interrupt your PC and your data will be confidential. Enter the group name and password,click "OK"to join your friends group,you can share and download what you want. Nowadays,transfer files from PC to PC become more and more important.In order to make it come true,many external drives such as USB or hard dirves can transfer files.However,these kind of drives have their drawback.Time watse and data lost,which disturb common computer user.To avoid the shortage of hard drive devices,Folder Transfer is your best choice.Folder Transfer is designed to transfer files and folders via LAN,it can not only send photos,music,video,pdf or other types of files,but also protect the security of your PC. To enrich your life,to bring convenience,to simplfy file sharing,let's download Folder Transfer ! Do you want to download a program that can transfer files and folders from pc to pc over the internet? Are you seeking a free pc to pc file transfer software lan? Go to download Folder Transfer for free and have a free trial experience. It is fast, reliable and easy to use! Folder Transfer is considered to be the best PC to PC file transfer software, with an easy to use sequential file transfer wizard that will guide you through the complete process to transfer files from PC to PC. The best feature of Folder Transfer is sending folders online from one computer to another in the minimum time as compared to other data transfer software and methods. Through Folder Transfer, you can select the files and programs that need to be transferred so that you can leave behind what is no longer required by you. Another significant feature is that when you run Folder Transfer on your computer for the first time, it will automatically connect to other computers where Folder Transfer is also runing via LAN. Therefore, if all your peer computers are in the same local network, you don't need to take any action for the local network connection setup. You just need to run Folder Transfer on each networked computer, then you can transfer your files to other computers over the local network. Other features include sharing files and folders across network, moving large files between computers, sending files remotely over internet or Intranet, etc. Read more features here. How to transfer files and folders pc to pc for free? The above two simple steps to let you transfer files from one computer to another, free! Read more information from the Online Manual, then you will know more exactly how to use this free file transfer program. Why you need download a free program to copy files to other computers in network? It has always been difficult to transfer data from one PC to another PC. If you are upgrading to the new PC or buying a new one then there is a lot of data that needs to be transferred from your old PC to your new PC. This is can be a daunting task, as you have to decide on which programs, files and folders need to be transferred and you might end up wasting a lot of time transferring the data manually. There are a lot of programs available in the market that can be used to transfer data from PC to PC. However, some of the softwares take a lot of time in sending data from one computer to another and are not very easy to use and require prior knowledge. The point that matters while transferring the data from computer to computer is the size of the files that have to be transferred and the time it will take to transfer the files. For example, an email can be considered as a software through which you can transfer files from one PC to another. But there is a size limit so that you cannot transfer large files. Another method could be using the LAN network, through which you can transfer files through shared folder that again will be time consuming. One of the best software programs for file sending is Folder Transfer, and it is capable of copying folders to multiple computers within network. If you wonder, "How to transfer files for free? ", "How to copy a folder from one computer to another? ", What is the fastest way to copy data from one drive to another through lan?" Try Folder Transfer to see how it transfers file from pc to pc. If you are looking for pc to pc file transfer software free download, Folder Transfer can be your top option! It gives you the best way to transfer and share your files. It makes pc to pc file transfer become easy and safe. Once you have tried Folder Transfer, you will love it and realize soon that transferring files from pc to pc will be easier and faster! 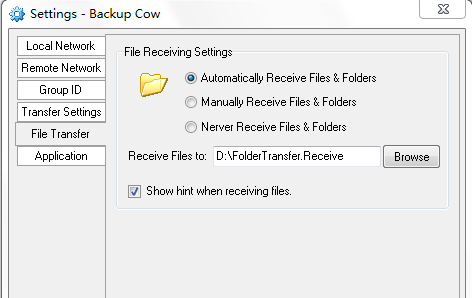 Folder Transfer is a free,easy,useful software product to transfer files and folders.It can not only transfer files from PC to PC,but also transfer files to multiple destinations at the same time.It is also the sister software called Backup Cow. Step 1 :Click "Send Files"to select files and folders you wish to send.Or you can drag and drop files or folders into the Sender box from Windows Explorer. Step2:Select destinations you desired to send files to.Multiple destinations can be selected. With Folder Transfer,you can transfer big files or folders, so you don't have to worry about the limitation of the size.Please feel free to try Folder Transfer! You can receive any files or folders from other PC,including remote computers.Besides,you can also view the size、status、file size，etc.Moreover,you can also run the selected file or delete the unnecessary files. If you are on holidays,you want to share your haappiness and joys to your friends.Folder Transfer is quite suitable for you.Your friends in any places can download your photos,videos,music,etc.Your joys will be shared via network even though you are in remote places. Directly input the IP address and port number of the remote computer or remote network.There you can connect to the remote PC or the remote network. Folder Transfer is a free、dependable software which support breakpoint transmission.If the network once disconnect,your data will not lose and your files and folders can be transferred or shared when the conncetion is fine again. Please download Folder Transfer for free! It’s about time for a reliable, user-friendly solution to file transfer! Folder Transfer is the best solution for you! Folder Transfer can transfer files and folders from pc to pc over local network or Internet/Intranet. It is also a file sharing program to let you share your computer files and folders to let other network users download anytime. Free Edition Available! Download and try Folder Transfer for free and see how fast you can send files. You might be surprised! The program can fully meet your needs. It can actually copy the files and folders to another computer. With Folder Transfer, you are able to transfer files and folders between multiples computers over local network or Internet/Intranet. Please go to download the software from http://foldertransfer.com/Download.asp . After you download and install Folder Transfer, you will get a permanent free edition (freeware). You may upgrade to Professional or Enterprise edition to get rid of some limitations in the free version. Click here to compare editions. For price information, view the Buynow page. Folder Transfer is an effective free file&folder sender software proudct, which can send files and folders to multiple computers over local network or Internet/Intranet. It is fast and easy to operate: Simply download Folder Transfer, select the files and folders you want to send, and Folder Transfer does the rest. This file transfer software can not only let you send files to another computer that you have in your house or office, but also let you remotely transfer and share files between computes over Internet or Intranet. It is a complete and reliable file transfer program, also available as freeware. The Free version of Folder Transfer has many interesting features (To see more features of Folder Transfer, visit the Main Features section), and it can be a very useful product for small and medium businesses. After running Folder Transfer program and setting up the remote network connection between computers, you can send your files and folders over Internet or Intranet to any remote destinations your computer connect to. Please download the software for remote send files over internet, free! With our promising software - Folder Transfer, you can not only transfer files and folders to multiple computers over network, but also share your computer files and folders to let other network users download anytime. Better yet, it's easy to use and you can begin sending and sharing your data free within minutes. It will be your best free file sender software and folder sharing software between computers. How to copy files from one computer to multiple over network? Are you looking for free application software download for sending files to another computer? Click here to download the file transfer pc to pc software ! After you download and install Folder Transfer, you will get a permanent free edition (freeware). You may upgrade to Professional or Enterprise edition to get rid of some limitations in the free version. Find out more on the the Features page, Online Manual page, by looking at Screenshots, and place your order on our Buynow page. Are there any efficient methods of transferring files, especially huge files from one computer to another over internet?There are some softwares that are available in the market for pc to pc file transfer. One of the best software programs for this is Folder Transfer, and it is a free software to copy files and folders to multiple PCs. It is an easy and fast way of moving programs, files and settings from one PC to another. Folder Transfer is considered to be the best free file transfer software between computers, with an easy to use sequential file transfer wizard that will guide you through the complete process to transfer files from pc to pc. Also, Folder Transfer will help you share your computer files and folders to let other network users download anytime. From now on, you can use this powerful tool to share files and folders, transfer files from one computer to another, or send files and folders for free to multiple computers no matter they are located in your office LAN , home network or even corporate remote networks. Folder Transfer transfers data from one PC to another PC in the minimum time as compared to other data transfer softwares and methods. Through Folder Transfer, you can select the files and programs that need to be transferred between computers so that you can leave behind what is no longer required by you. Which is the best application for sending and receiving files between PCs? Folder Transfer! Try it to wirelessly transfer files pc to pc, free! After you download and install Folder Transfer, you will get a permanent free edition (freeware). You may upgrade to Professional or Enterprise edition to get rid of some limitations in the free version. Please view http://foldertransfer.com/EditionComparison.asp to compare editions. How to transfer files from pc to pc automatically? Are you looking for software to share files over the net with friends? Please try Folder Transfer, which is free automatic file transfer program that can transfer files and folders to multiple computers over local network or Internet/Intranet. In addition, Folder Transfer is also a file sharing software that can share pc files over the internet. You can share your computer files and folders to let other network users download anytime. Please download Folder Transfer for sending files between computers. It is not only a folder sharing program, but also a network file transfer a that can help you send files to other. Folder Transfer is one of the best file sharing programs for business and individuals. There are various ways available to transfer files over internet but almost all of them comes with restrictions. If you use online storage servers, there are restrictions like limits on maximum volume of files or storage space. Moreover, it takes a lot of time to upload a big file on the server. And it’s not always possible to use peer-to-peer networks for sending files. That’s where this free file transferring tool helps us. *Secure: This freeware doesn’t store any information about files to server and you can transfer files anonymously without giving away your name, country and e-mail. So, it’s a secure way to transfer files. * Fast: It doesn’t upload files to any file storage and creates a direct connect from user to user to send files directly. So, it’s a fast way to transfer files. Moverover, if any of your file gets broken when downloading, don’t worry as it supports resuming. Do you need a tool for moving files and folder automatically? Do you want free utility to copy data from one pc to another or utility to copy data from one pc to another? Folder Transfer can be your best choice! View More Information from Online Manual . Transferring files, especially large files from one location to another has traditionally been a time consuming and somewhat painful task. But thankfully, Folder Transfer has made large file transferring from one pc to another much easier and faster. With the free big folder transfer software, you can send unlimited large files to any computers over the internet at incredible speeds and with superb levels of security. * Are <?xml:namespace prefix = cvml ns = "urn:schemas-microsoft-com:vml" />your files too large for email attachments? * Looking for the fastest free data transfer software to send large files to someone? * Want to send 100's of files without having to zip or compress them? * Do you want to share your favorite music or share your large photos with your friends? * Do you need an internet file transfer software to copy large files automatically to mutilple PCs over local or remote network? Folder Transfer can do these and much more! Fast, easy to use, private, practical and time saving alternative to website upload, email attachments and FTP. You can transfer files and folders to multiple computers over local network or Internet/Intranet. You can also share your computer files and folders to let other network users download anytime. How to Send large files between two computers over Internet or Intranet? One is to join the same network group. The other is to directly input the remote computer's Internet IP address or port number. Please view Network Connections in the Online Manual. Are you looking for the best free file sharing software? Please try Folder Transfer, which is a pc to pc file sharing program that can share your files and folders with your friends over Internet or LAN. You can use this auto network file sharing utility to let others download your shared files from your computer anytime over the internet or LAN. In addition, Folder Transfer is also a pc file transfer software that can transfer files and folders to multiple computers over networks. What can you do with Folder Transfer? * Other users can connect to your computer to download the shared files and folders they need. If you are looking for a pc to pc file sharing software, you'd better choose Folder Transfer. It is the best file sharing program built for people that need to transfer files PC to PC regularly. It helps you share files, photos, music and video with your friends. Free version is available! How to transfer data from a computer to another by internet? Please try Folder Transfer ! It is the best free network file transfer software that can transfer your files and folders over LAN (Local Area Network) or over Internet (remote network access). You can use this automatic network file transfer program to remotely transfer files to multiple destinataions across networks at a time. You can use this free network file transfer program to transfer and share files from one pc to another over internet, or transfer files to multiple computers no matter they are in your office LAN , home network, corporate remote network (Intranet or VPN), or even anywhere on the internet. Sooner or later you will find yourself in a situation where you need to transfer files between two PCs. Maybe you bought a new PC and want to transfer your documents from the old PC to the new PC. Maybe you have a laptop and want to synchronize the files between your desktop and your laptop. For this purpose, here comes equipped with a great tool called Folder Transfer , which is the best free software to transfer your files and folders from one pc to another over local network (LAN) or remote network (Internet or Intranet). You can use this free file transfer solution to copy files from pc to pc, or send files to multiple computers no matter they are located in your office LAN , home network or even corporate remote networks. Why do you need Folder Transfer? 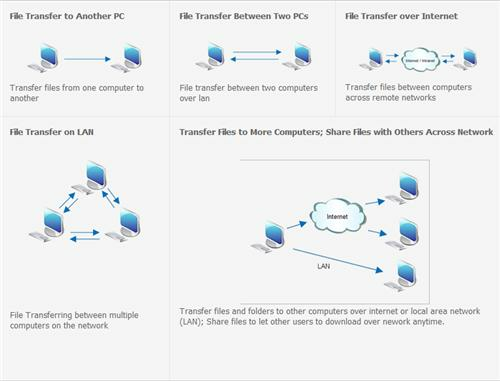 Here we run into the task of transferring and sharing files to multiple computers over local network or remote network with Folder Transfer software. Folder Transfer is the best free software for transferring files from pc to pc and for remote file transfer between computers over Internet. That is, no matter your network connection mode is LAN, WLAN (wireless LAN), WAN (Internet/Intranet/VPN), Folder Transfer can provide you the easiest way to transfer files from pc to pc, or from one computer to multiple computers. Do you want to transfer files from pc to pc? Try Folder Transfer right now! If you're looking for a way to transfer large files that's both totally free and a pleasure to look at, Folder Transfer is a user friendly and free file transfer service. It is the best pc to pc transfer software to send large files and folders over Internet/Intranet. You can use this auto large data transfer free program to remotely send files to multiple destinataions at a time. Folder Transfer is a very handy free large file sending software to send and share large files to another computer. You just need run the top app on your own network computers, then you can transfer and share big files from one computer to another over internet. Do you have the largest files to transfer ? Try Folder Transfer that is the best free large file transfer software to transfer files between computers over the Internet. Folder Transfer is a free file sharing and transfer software built for people that need to transfer files from pc to pc over the Internet or LAN/home networ . It also helps you share files, photos, music and video with your friends. The simple interface of this file transfer and sharing program makes transferring and sharing files as easy as dragging and dropping files. Folder Transfer became Freeware since 05/2012! Please download Folder Transfer for data transfer and file sharing between computers. It is not only a lan file sharing software program, but also a remote network file transfer application that can help you send files to others over Internet. Folder Transfer is one of the best file transfer and sharing programs for business and individuals. If you are looking for a free file transfer and sharing program, why not try Folder Transfer? It is easy to use and free version is available. You can use this free file sharing program to share files and folders, transfer files from one computer to another, or send files to multiple computers no matter they are located in your office LAN , home network or even corporate remote networks. 1. Home Delivery: Have you ever left an important document at home, and wished you could reach through the Internet from work to retrieve it? 2. Photo Sharing: Do you want to share your photos with your friends? 3. Video Sharing: When you export films from your digital video cameras, how to share those monster files? 4. Music Sharing: Do you want to share your favorite music with your friends? 5. File Sharing: Would you like to share file types other than pictures? 6. Email Issues: When you want to send large files via email, the email programs and email systems do not allow file attachments of a certain type or bigger than a certain size. 7. Authentication Download: You want to share some files with friends but want block anonymous access. Large File Transfer: Other softwares transfer large file slowly and cannot resuming transfer and download after broken connection. You may use file sharing all the time to ensure that your colleagues have access to some critical files or your friends can share your photos without being chained to desks in a single room. File sharing gives you mobility and allows you to find connections with your colleagues or friends even though you are in different places . It is really helpful, but it is a problem whether you can afford it. Nowadays, many file sharing apps are on the market, but some of them are really expensive. Folder Transfer is an exception, which offers permanent free version and its paid proffesional and enterprise versions are low-priced and one-off payment. * Click "Add Files" or "Add Folders" to select files or folders you wish to share (Or drag and drop files or folders from Windows Explorer), and the files or folders will be automatically shared at the same time. * Click "Download", then select the online computer and shared folders or files you wish to download. * Select download path you wish to store the shared files. It is very simple, right? If you want a file sharing program to share files or pictures with your friends, please feel free to download Folder Transfer on our Download Page. Furthermore, Folder Transfer is also a powerful utility for file transfer between local and remote network computers. Have you gathered lots of vacation photos and wanted to send them to your friends? Or are you upgrading to a new computer and need an easiest way to quickly transfer your files on your old PC to your new machine? If so, Folder Transfer may rank No.1 in your list. Folder Transfer is the easiest way to quickl transfer files over LAN/Intranet/Internet. It is high speed PC to PC file transfer software. Here is a quick look at the usage scenarios of Folder Transfer. If knowing the IP address and port number of a computer, how can I send big files using Folder Transfer? In this circumstance, you can choose the method, "Connect to a Computer". The specific steps are as followed. 1. Run Folder Transfer on your computer and another one. 2. On another computer: File Transfer- Network --> Connect to a Computer --> Input your computer's IP Address and Port Number (usually the port # is 8585, or you may find it in your computer's Folder Transfer), then click OK.
3. Then Folder Transfer will instantly send your big files to another computer. However, the IP address may be often changed, so another method, "Join a Grougp" is more worthy of recommendation. As to this method, which is highly recommended for remote network, you don't need to know any IP address or port #. Here are the instructions. In addition to remote file transfer software, Folder Transfer is also a folder share program, which allows to share pictures, movie and other files with networking users and supports downloading other network users' shared folders. If you need free file sending and sharing apps, please free download Folder Transfer. By the way, Backup Cow is sister freeware of Folder Transfer. If you are searching for private cloud backup solutions, please have a free trial of Backup Cow. Folder Transfer is the best free remote file transfer software that can transfer your files and folders over LAN (Local Area Network) or over Internet (remote network access). You can use this automatic remote file transfer program to remotely transfer files to multiple destinataions across networks at a time. Why you need a remote file transfer software? Today many of us work with more than just one computer. For instance, you can use one PC in your office and another at home, etc. In such case you probably want the files you work with to be the same on all the computers you are using.Here we run into the task of transferring files between home and office computers over remote network with Folder Transfer software. If you are a company owner with a few branches or divisions across the country, you need to remotely send files or folers to those branch companies or remote divisions every day. You may consider some factors as you are looking for a remote network file transferring program to. Such as, Can I transfer my files over Internet without using any internet cloud services ? Is there a remote network file application for sending files from one computer to another? Try Folder Transfer, which is one of the best remote file transfer programs that can transfer files via Internet or other remote access like VPN, Intranet, WAN. How to transfer files from my office computer to my home computer remotely? * Run Folder Transfer on both computers at home and your office. * In your home computer's Folder Transfer: Network --> Connect to a Computer(for Advanced Users) --> Input your office's internet IP and port number (usually the port number is 9595, or you may find it in your office computer's Folder Transfer), then click OK.
* If the files or folders you sent last time have changed, you can "Resend" them. File transfer doesn’t have to be a challenge. Download and install Folder Transfer today for permanent use to begin transferring files in the smartest way. Have you ever had trouble sending a batch of photo to your friend via email? The answer may be yes. Most mail servers have restricted the maximum size of file attachment, 10MB or even much less than that, which makes it impossible to send big files for one time. If you are trying to transfer any "oversize package" exceeding the size limit, such as a video file or a photo compressed files, the "small mailbox" cannot go through it. Fortunately, many free file transfer applications let you work out this size restriction problem. Among those software, Folder Transfer is a great option for you. It can help you fast transfer big files through computers that are networked. It also supports sharing files and folders with other networked users. Folder Transfer's Free Version is also available now. * Run Folder Transfer on both machines. * In your friend's Folder Transfer: File Transfer- Network --> Connect to a Computer --> Input your computer's IP Address and Port Number (usually the port # is 8585, or you may find it in your computer's Folder Transfer), then click OK.
Because the IP address may be often changed, "Join a Group" method is more worthy of recommendation. 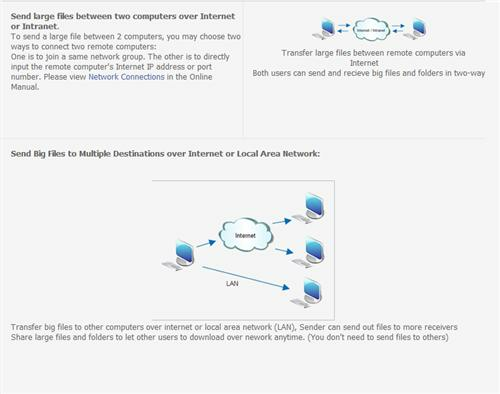 Furthermore, if your computer and your friend's are in the same local network, there is no need to set any network connection, because Folder Transer can automatically connect to each other when it is running in same local network environment. You only need to run Folder Transfer in both two machines. Then you can transfer files over LAN. In addition to file transfer, Folder Transfer also allows to share a large file on a network over Internet/Intranet. Here are the steps. If you want to delete your shared files or folders, you can remove it. The steps is as followed. That's it! Very easy, right? If you want to have a free use experience with this best file transfer software over Internet/Intranet/LAN, please download it on our DOWNLOAD PAGE. For more information about this file transfer and sharing solution, please enter our HOME PAGE. Folder Transfer Software is a file-transfer utility for your home and office, which can instantly send files or folders to any user on your network. It also helps you to share files, photos, music and video to let other network users download anytime. Free Edition Available! Folder Transfer can transfer files and folders to multiple computers over local network or Internet/Intranet. So how can you transfer files from PC to PC over network? Here are different methods you may choose. Once you run Folder Transfer on your computer, it will automatically connect other computers on which Folder Transfer is also running across LAN. Therefore, if your peer computers are in the same local network, there is no need for you to setup any network connection. What you need to do is just to run Folder Transfer on all networked PCs. Then you can transfer files to each other over LAN. 1. Join a Group (Recommended). All Folder Transfer users can connect together by joining the same network group: "File Transfer-Network-Join a Group". (You must create a group account firstly, then two computers log in the same group.) In this way, two computers can be connected together. 2. Connect to a Computer. You can connect to a remote PC by directly entering its IP/domain and port number: "File Transfer-Network -- Connect to a Computer". Now you can start to transfer files between two remote peer computers. Folder Transfer is compatible with these operating systems: Windows NT 4.0, Windows 2000, Windows 2003, Windows XP, Windows Vista and Windows 7. Using Folder Transfer you can easily and instantly transfer your files to any local or remote networked PC. It is the best free files transfer solution for your business or personal use. The download package comes with a permanent free version. Even if its Professional and Enterprise editions are need to be paid, they are still much more low-priced than many other files transfer programs. Try it, you'll never want to use something else for transfering files! Folder Transfer is free file transfer software built for people that need to transfer files PC to PC regularly. It helps you share files, photos, music and video with your friends. Why choose Folder Transfer FREE Software? * Home Delivery: Have you ever left an important document at home, and wished you could reach through the Internet from work to retrieve it? * Photo Sharing: Do you want to share your photos with your friends? * Music Sharing: Do you want to share your favorite music with your friends? * File Sharing: Would you like to share file types other than pictures? * Home Office Transfer: Do you want to transfer files from home computer to office computer remoterly? * Large File Transfer: Do you want to transfers large file very fast and resume download after broken connection? You can use this free file sharing software to share files and folders, transfer files from pc to pc, from one computer to another, from laptop to desktop, or send files to multiple computers no matter they are located in your office LAN , home network or even corporate remote networks. Transferring your data is made easy with Folder Transfer's east-to-use, step-by-step wizard. Unlike other programs that transfer files, IntelliMover instantly enables you to quickly transfer files from one computer to another at high speed. Transferring files is as easy as selecting what data you want to transfer. From now on, you can migrate hundreds files and folders by selectively choosing what data you want to transfer. Your new computer will look like your old computer, but without the clutter. Transferring to a new computer is the perfect time to choose what you do not want on your new computer. Please read this Online Manual from http://foldertransfer.com/support.asp , which can help you install and start using this software. Are you seeking a reliable free file transfer software to send your computer files to another computer on the network? Folder Transfer can be your best free network file transfer software that can transfer your files and folders to multiple computers over LAN (Local Area Network) or over Internet (remote network access). You can use this free network file transfer program to transfer files from one pc to another over internet, or transfer files to multiple computers no matter they are in your office LAN , home network, corporate remote network (Intranet or VPN), or even anywhere on the internet. Folder Transfer is a powerful network file transfer freeware tool for both personal and commercial use. With this automatic file transfer software, you can transfer files to any pc in your local network (LAN). You can transfer files to more than one computer across network. Folder Transfer is an ideal file transfer utility to let you send copies of files and folders to another computer or a network drive automatically. In addition, You can not only transfer files to another PC in your LAN, but also use the remote file transfer solution for all of your PCs, regardless of their locations. Folder Transfer can transfer files over network, including Internet and Intranet. It is the best free software to transfer files from one pc to another remote pc. How to transfer files to another computer on the network? For the first time when you run Folder Transfer on your computer, the software will automatically connect to other computers where Folder Transfer is also running over the local network. So, if all your peer computers are in the same local network, you don't need to take any action for the local network connection setup. You just need run Folder Transfer on each networked computer, then you can transfer your computer files to other computers across LAN. All Folder Transfer Users can connect together by joining a same network group: "Network -- Join a Group". (You must create a group account firstly, then two computers log in the same group.) In this way, two computers can be connected together. 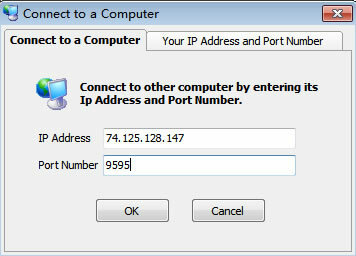 You can connect to a remote PC or network by directly entering its ip/domain and port number: “Network -- Connect to a Computer”. Now you can start to transfer files between 2 computers. You just need to add the files or folders you want to send, and select the destination receiver, the software will start to transfer files automatically. While I had the computers on the home network they all communicated and transferred files between computers . Now that the laptop has moved to a remote location, we are having problems. When the laptop boots up and Folder Transfer is running, I have the little computer and name pop up in the Network Computers list. However it doesn’t turn blue and the properties show it as UnReach. When I wand over it with the pointer it reads Offline. If the laptop shouts down, the computer stops showing in the Network Computers box. I get the impression I’m close to having this working but not sure what to try next. Can you lend a hand? 3. Is it possible to change the mode of transfer files? For example, can I transfer a large amount of data between two computers over a LAN, then move one to another location and continue transferring over the internet? 1. A "user" means the person who use Folder Transfer software. You just need to register the computer which you want to send files from. 3. Yes! 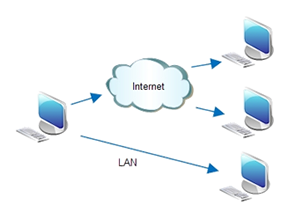 If you want to transfer a large amount of data between two computers over a LAN, then move one to another location and continue transferring over the internet, we suggest you choose "Remote Netwok" on both computers' Folder Transfer, then join a same network group: "Remote Network -- Join a Group" (You must create a group account firstly, then two computers log in the same group. ) In this way, two computers can connect together.Then you can transfer files between these two computers no matter they are in LAN or Internet. * I just purchased your product, and apparently misunderstood what it meant by users. I want to transfer files between my computers. Two of the computers are at remote location. Do I have to pay $29.99 for EACH COMPUTER? Really, all I need to to is be able to easily transfer files from the remote location to my home location. Can I just register the computer at the remote location, so it can transfer unlimited files to my home computer, or do both computers need to be registered? Thank you! As for your case, the computers on both remote location and your home locations must be installed Folder Transfer software, but only the one that you want to transfer files needs to be registerred. You do not need to pay and register for each computer. Folder Transfer is the best way to transfer files from pc to pc no matter you want to transfer files from desktop to laptop, or transfer files from laptop to desktop. If you are a salesman in your company who need get new product materials from your manager's desktop, all the files are in a same folder and are updated every month, what is the best way to transfer files from computer to laptop ? Try Folder Transfer ! It is a file transfer freeware to help you transfer files from one laptop to another laptop.You just need to drag and drop the folder into the software, and select the destination computer you wish to transfer, all files will be transferred automatically. No matter your network computers are connected by ethernet cable or wireless wlan router, Folder Transfer can help you easily to transfer files from pc to pc. Please uninstall Folder Transfer on the old machine and install it on the new computer. Then provide us with the old Computer ID and your Order ID, and we will transfer the license for you. On the laptop I wish to transfer files from I am unable to connect to Folder Transfer, even though I am connected to internet. Can you help me resolve this? * You must run Folder Transfer program on two computers respectively. If not, you may choose "Remote Netwok" on both computers' Folder Transfer, then join a same network group: "Remote Network -- Join a Group" (You must create a group account firstly, then two computers log in the same group. )In this way, two computers can connect together. "Hi, im in the process of transfering files from my old laptop to my new laptop, everything is running smoothly so far, the only question i have is once all the files have been received by file transfer, how do i then get them up onto my new laptop???" 1. Double click the received item, (Or: Right click the item to select "Explorer") , then you can open the receiver folder where the items are located, then you can move them with Window Exploerer. 2. Actually, you can set the receiver folder by yourself, so that you can receive the files in to a destination folder at your will. Please do that from :Settings -- File Transfer-- File Receiving Settings ". You can also select Automatically or Manually or even Never receive files and folders. Which software is the best free file transfer program? Please try Folder Transfer, which is a PC to PC file transfer software that can transfer your files and folders over LAN (Local Area Network) or over Internet (remote network access). You can use this auto file transfer tool to send files to multiple destinataions at a time. Unlike other programs that transfer files, Folder Transfer instantly enables you to quickly transfer files from one computer to another at high speed. Transferring files is as easy as selecting what data you want to transfer. Transferring your data is made easy with Folder Transfer software. Migrate hundreds of files by selectively choosing what data you want to transfer. Your new computer will look like your old computer, but without the clutter. Transferring to a new computer is the perfect time to choose what you do not want on your new computer. I am using the free version of Folder Transfer to evaluate for my needs and would like to use this, however, I have so far been unsuccessful even though I have opened the relevant ports on the router. If it is available in the free version can you please give me some ideas as to what to check next. Transfer Files from PC to PC, Free Version Available ! How to transfer filed from pc to pc? Please try Folder Transfer, which is a PC to PC file transfer software that can transfer your files and folders over LAN (Local Area Network) or over Internet (remote network access). You can use this auto file transfer tool to send files to multiple destinataions at a time. Please download Folder Transfer for file transferring between computers: http://www.foldertransfer.com/Download.asp , Free Version Available! If you need a software to transfer files from pc to pc, from computer to computer, please download Folder Transfer, which is the best automatic file transfer software for network with permanent free edition (freeware). The automatic file transfer software can transfer files to another computer via local network or internet & intranet. It is the best software to transfer files and folders to multiple computers. Folder Transfer lets you send copies of large files from one computer to another computer. You can transfer files to another PC , and use the remote file transfer feature to transfer files to other network. For example, you can remotely transfer your files from home computer to the workstation or server in your office. Please visit our product website http://www.foldertransfer.com and read more information about Folder Transfer. How to transfer files from my office computer to my home computer? * In your home computer's Folder Transfer: Remote Network --> Connect to a Computer --> Input your office's internet IP and port number (usually the port number is 9595, or you may find it in your office computer's Folder Transfer: Remote Network --> Connect to a Computer --> Your IP Adress and Port Number), then click OK.
Folder Transfer is the best free software to transfer files and folders to multiple computers.You just need to run Folder Transfer application on each netwotked computer, which you wish to send files from or send files to, then you can transfer files and folders between computers. So you need run Folder Transfer on at least two networked computers in order to implement network transfer. Please read the Online Manual on our site http://www.foldertransfer.com/support.asp , which can help you install and start using this software. You may always contact us by email tech.support@chat4support.com or click Contact Us. Folder Transfer is the best software to transfer files and folders between computers. If you are seeking a software for data transfer between computers. Please download the software for free trial. Folder Transfer offers a simple and secure way to transfer personal files and business documents, securely share files with colleagues and friends. The software can transfer files and folders between multiple computers. It is very useful letting you automatically transfer files between multiple computers. You may download it to any computer on your network no mattter it is your desktop or laptop computer. 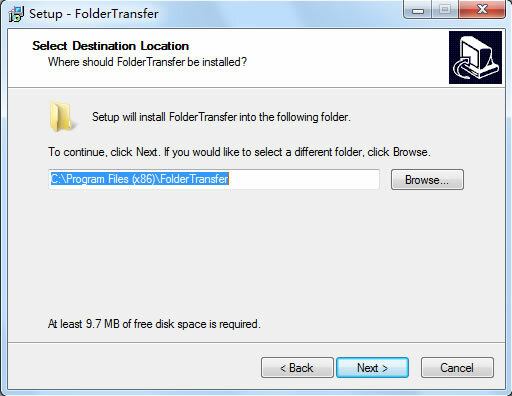 You must install Folder Transfer software on at least two networked computers in order to transfer files between computers. When you run Folder Transfer app on the two networked PCs, you will see two computers to go online on the right hand side of the program main window. Then you can start to transfer files between two computers. Are you looking for an automatic network file transfer software product that can function well at your company and home ? Is there a free remote network file transfer software product ? Yes! Don't buy expensive network file transfer solutions when Folder Transfer has everything you ever need.Please download Folder Transfer for network file transferring between computers over internet or LAN. Folder Transfer is a permanent free remote netwok file transfer software proudct, which can transfer your data to a remote place via Internet or Intranet. Is it reliable to transfer files between remote computers over internet ? Yes. The remote network file transfer tool can support breakpoint transmission, so you don't need worry about network connection interruption. The remote network file transfer program also provides an option for users to use MD5 file verification furing data transfer, which can make sure the remote data transmission is very reliable. Folder Transfer is network file transfer freeware. The free edition is permanently free and good enough for personal use. It is recommended you register the professional and enterprise editions because of unlimited file transfer size. Please download the remote network file transfer software, free ! Folder Transfer is the best software to send large files and folders over Internet/Intranet. You can use this auto network file transfer program to remotely send files to multiple destinataions at a time. Try Folder Transfer, which is one of the best internet file transfer softwares that can send files via Internet or other remote access like VPN, Intranet, WAN. And both the single file size and the total file size you can send will be unlimited if you use Enterprise edition of the software that is the cheapest in terms of pricing. No matter you are going to send a video file or a folder with photos to your friends online, Folder Transfer is the best tool to send files! Please download Folder Transfer to send big files between computers over Internet or Local Area Network.